It's time to award the prizes for the February Scraptastic Tuesday link up. I have done no sewing since Tuesday, but I travelled to Vancouver early Saturday morning for a few days of vacation, going back tomorrow afternoon. I was able to meet up with my friend Krista, who blogs at Poppyprint, for a lovely dinner. 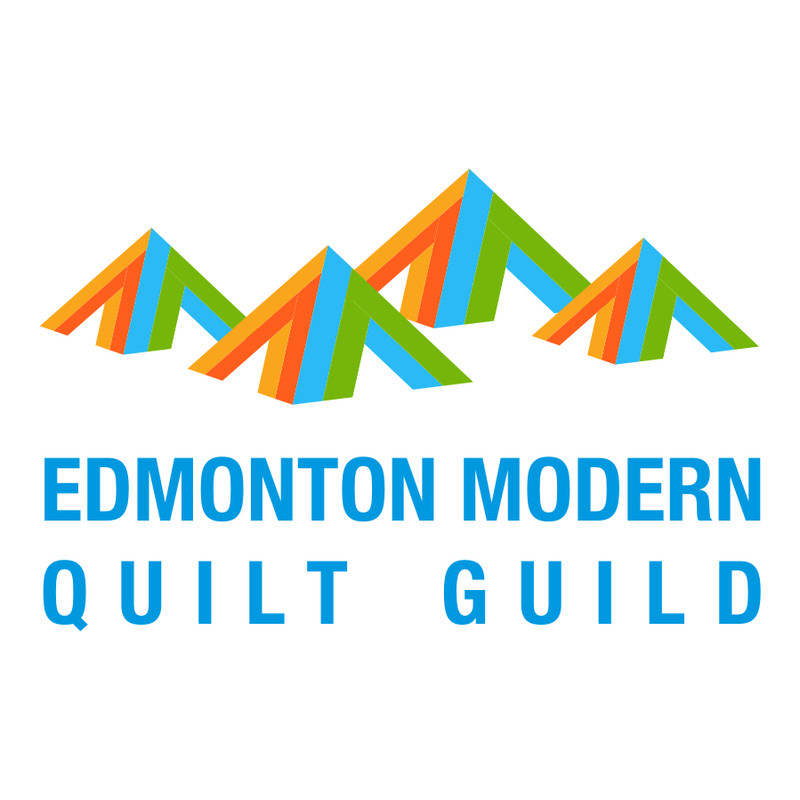 I also was able to attend the Vancouver Modern Quilt Guild meeting as well. Krista gave me that beautiful mini quilt! 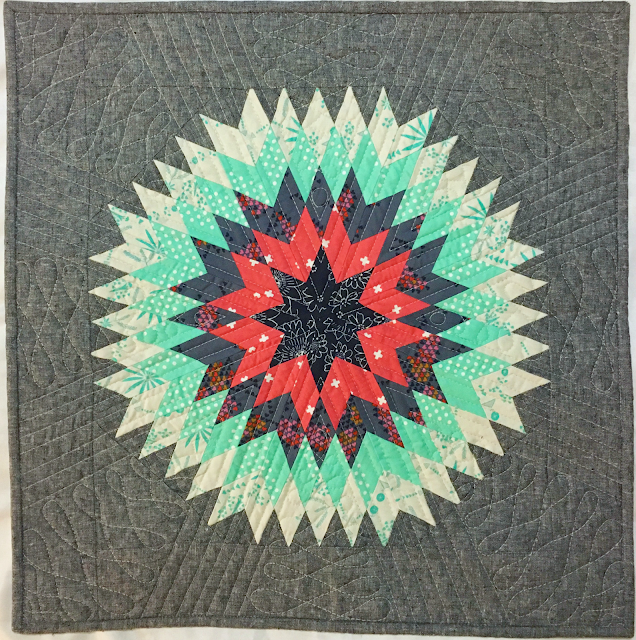 I have long admired the round Texas lonestar pattern by Lynne at Lily's Quilts that is in Krista's book Make It, Take It and now I have a beautiful mini of my own, which I am sharing today instead. A huge thank you to our generous sponsors for providing the following prizes which have been awarded randomly among those of you who linked up. I'll be getting out the prize emails to the winners as soon as the spotty internet and holiday schedule permits. If you have not yet done so, check out the linked up projects, they are lovely, go here. And please plan to join Nicky from Mrs. Sew and Sow and I on the second Tuesday in March for the next Scraptastic Tuesday link up. We are more than midway through the month, and Yvonne, Beth and I would like to take this opportunity to remind you we are still accepting registrations for the 2017 New Quilt Bloggers Blog Hop. 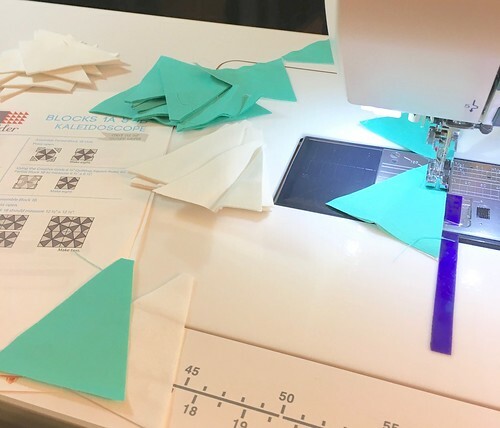 The goal of the 6th annual New Quilt Bloggers Blog Hop is to provide advice, tech help, and introduce new quilters to the online community. 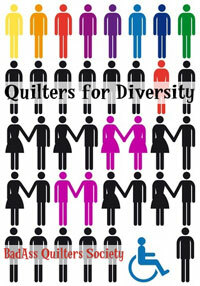 If you are a new quilt blogger and meet the criteria (see below), please indicate your interest in joining by filling out the registration form. Participation in the New Quilt Bloggers Blog Hop is a great way to meet other bloggers and network in a friendly and encouraging environment. 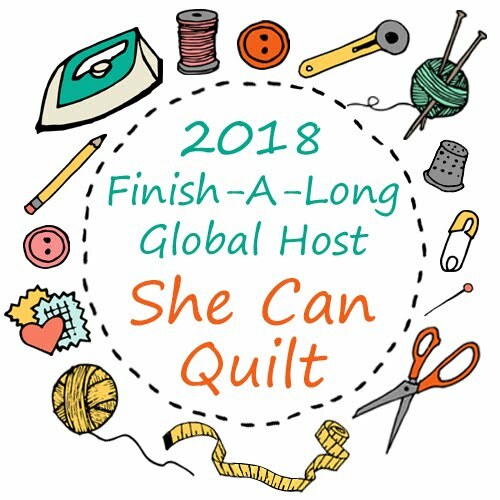 You can (and most likely will) make personal connections and lifelong quilting/blogging friends. Note that after you indicate your interest by filling out the registration form, you will not receive email confirmation until the beginning of March at the earliest. We will accept 100 participants for the blog hop this year. The sign up form will be available until February 28th, 2017, or until we reach 100 participants. Participation in the blog hop will consist of a significant time commitment. We believe that the more time you can dedicate to the blog hop, the more you will get out of it. Early March: Welcome participants via E-mail and get everyone into the Slack group to facilitate and begin the conversations. March: Get to know one another through a series of weekly planned prompts through the Slack group. March: Optional structured blog critique groups will be conducted. April: First half (2 weeks) of blog hop. May: Second half (2 weeks) of blog hop. If you have questions you would like answered prior to registering, please feel free to leave a comment and I will do my best to answer your questions. Carla from Granny Maud's Girl talks about some of the benefits she received by participating in the 2014 New Quilt Blogger blog hop in her post, Calling new quilt bloggers. 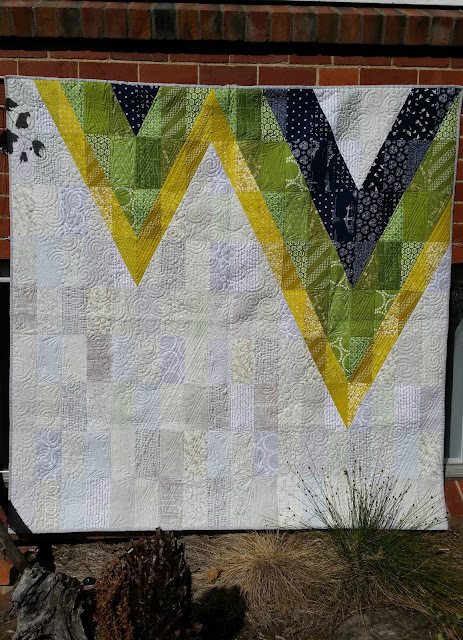 Anne from Hudson Valley Quilts reviews a lot of what she learned during the 2014 New Quilters Blog Hop in her post, New Quilt Bloggers Blog Hop - 2017. 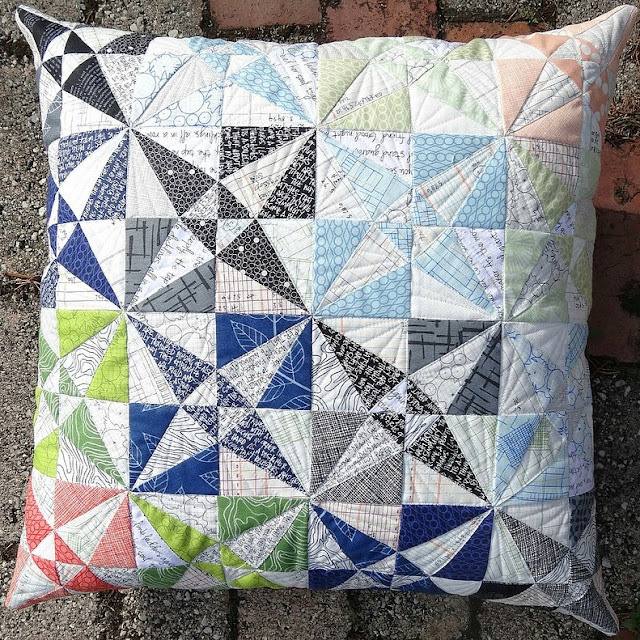 The Canadian Sampler - are you sewing along? I was invited last year by Sew Sisters Quilt Shop to participate as one of the designers in The Canadian Sampler to celebrate Canada's 150 Anniversary. 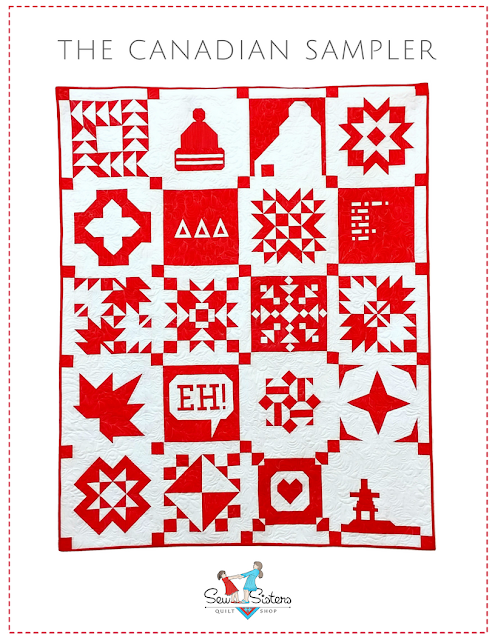 This block of the month consists of 20 blocks designed by Canadian designers to create a red and white quilt that expresses our love of our country. Participants receive 2 block patterns a month for 10 months, giving us 2 months to finish the quilt before the end of the year. My block is second row from the top, second from the left - the one with the three triangles. I am not sure which month my block will come out but I will tell you more about my inspirations for it when it does. I also want to say that Sew Sisters Quilt Shop fairly compensated each designer for their contribution to this quilt, gave plenty of time to design, and were wonderful to work with. 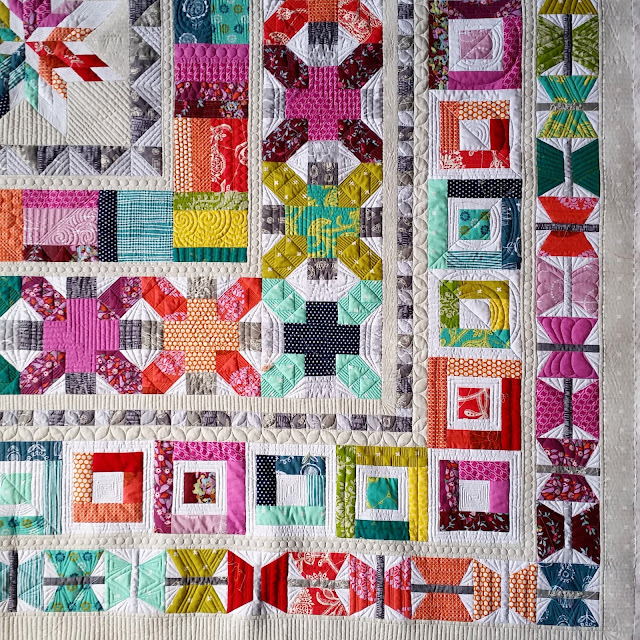 I was not sure I would sew along with the block of the month until I saw the quilt, and I have to say I am so proud to be included in a quilt designed by such talented Canadian quilters - I cannot resist joining in. If you want to join, the registration is open until the end of February so act fast - go here to register. 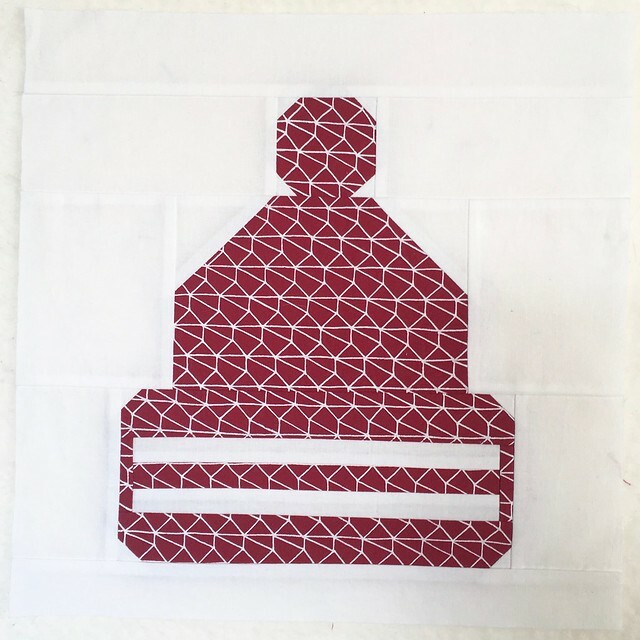 That fun toque block, called Keep'n Warm is Block 1 and it was designed by Sandy Whitelaw from Upstairs Hobby Room. This block shares a representation of the typical Canadian toque, which is a knitted hat with a rolled up brim and a pom pom - I expect most every Canadian has owned one in their life, and probably still does. 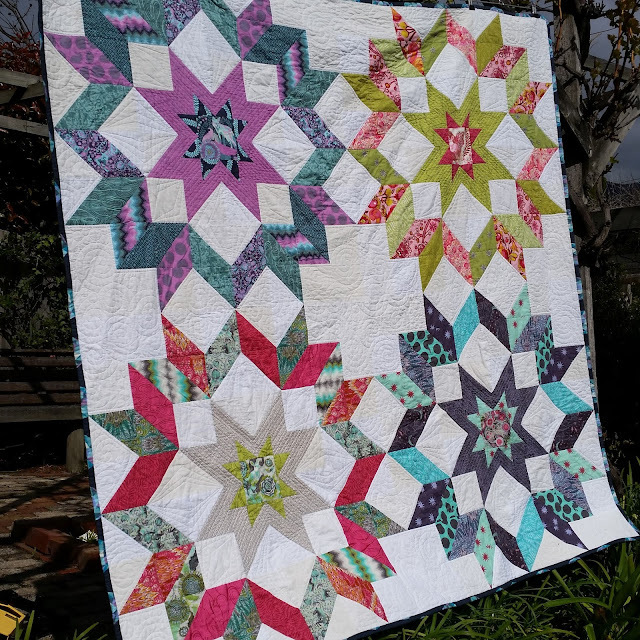 Block 2 is called Pacific Stars and was designed by Daphne Greig from Patchwork Studio. 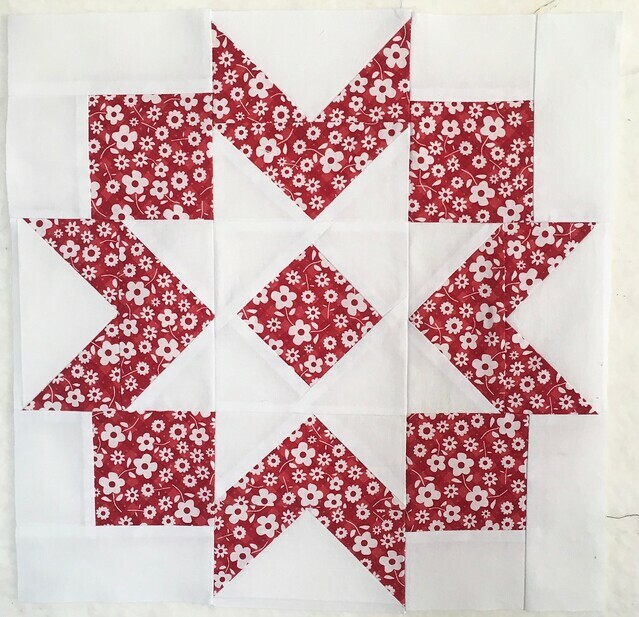 I love the star in star created with this block. 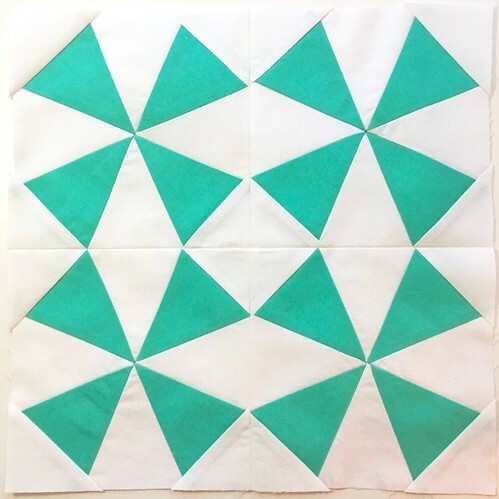 I must say that I found that my precision piecing skills are rusty after so much focus on improv work, so it took me a bit longer than it should have - but it was well worth the effort. Here they are together, all blocks in the sampler finish at 12" square. The February block patterns arrived yesterday in my mail box - I expect that I will have time to start them soon. Hi, I'm Jess, otherwise known as Elven Garden Quilts. This is my second year as a FAL host, and although I'm not great at actually participating in the FAL (I have a pretty bad history of not finishing anything on my list! ), it's great to be back to cheer you all along for a second year. I thought this was going to be a really hard post to write - but once I got started it was surprisingly easy. So I've inserted photos of some of my favorite quilts in amongst the text - feel free to skim the words if you'd rather just look at quilts ;o). I'm a 36 year old mum of three not-so-small people - my eldest son (12 year old) started high school this year (grade 7), and I have a 9 year old son and a 6 year old daughter. Needless to say, moments of sewing have been few and far between over the last few months while they've had their summer holidays - but they went back to school last week, so there is some semblance of normality in our household again :o). I have an incredible partner too, who encourages me in all my quilty endeavours and listens patiently when I ramble on about my current projects. We also have two fur babies - Shadow and Pepper, our little quilt-cats, who spend at least 90% of their time asleep on various quilts and cushions around the house! 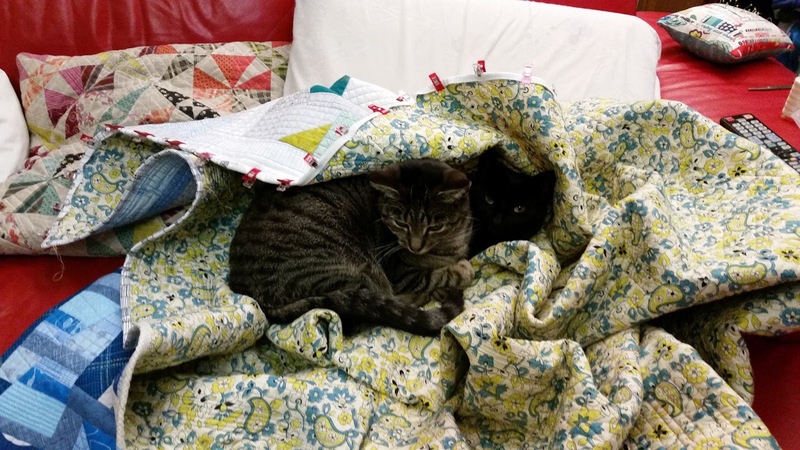 I'll often go back to hand stitch binding and find my quilt has been invaded by cats ;o). 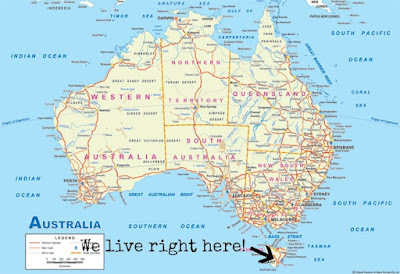 We live in Tasmania, Australia - that little island that sits off the southern coast of mainland Australia. 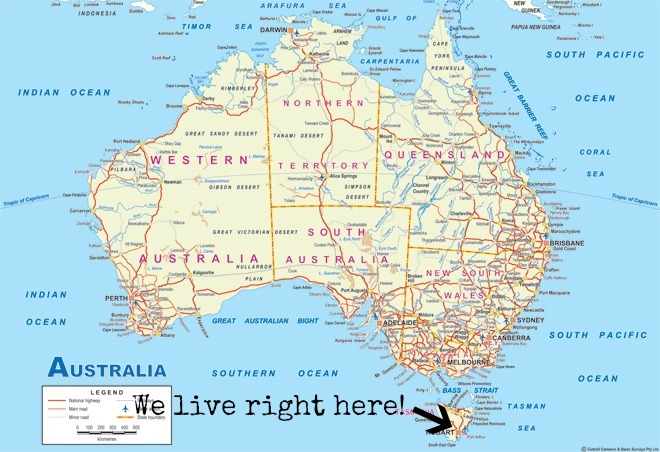 It's a beautiful place to live - we don't have a huge population and we are surrounded by some of the most gorgeous wilderness in the world (in my humble opinion!). I grew up in a pretty arty/crafty family - my Dad studied ceramics at Art School and is an art teacher at a college, and my mum has always been involved with some sort of textile art. She made most of our clothes as kids, and is now obsessed with spinning and knitting all kinds of gorgeous yarn. So it's kinda unsurprising that I've grown up to be a maker. Although I have a science degree (and work as a lab technician part time), I've always enjoyed making stuff. I started cross stitching when I was quite young, and continued that hobby right through to my university years. It wasn't until I had my youngest child that I decided to get a sewing machine - with the intention of making clothes and toys for my kids. I had fun doing this for a while, but then on a whim I bought a beginner's quilting magazine and that was the beginning of a true obsession. For me, quilting is the perfect marriage of maths and art - I love numbers and I love working with colour, so it's not surprising it has overtaken all of my spare time! 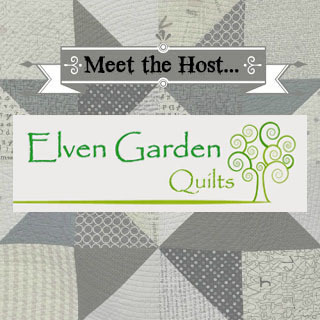 I started quilting around 5 or 6 years ago - and back when I started, my tiny sewing room overlooked the garden - so Elven Garden Quilts was born! After a few years, I outgrew that little room, so my 'studio' is now our garage - not the prettiest location, but I can be as messy as I want (and believe me, the term creative chaos fits me perfectly!) and close the door on it so no one else has to be subjected to it ;o). 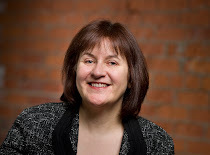 I first started blogging for a few reasons. 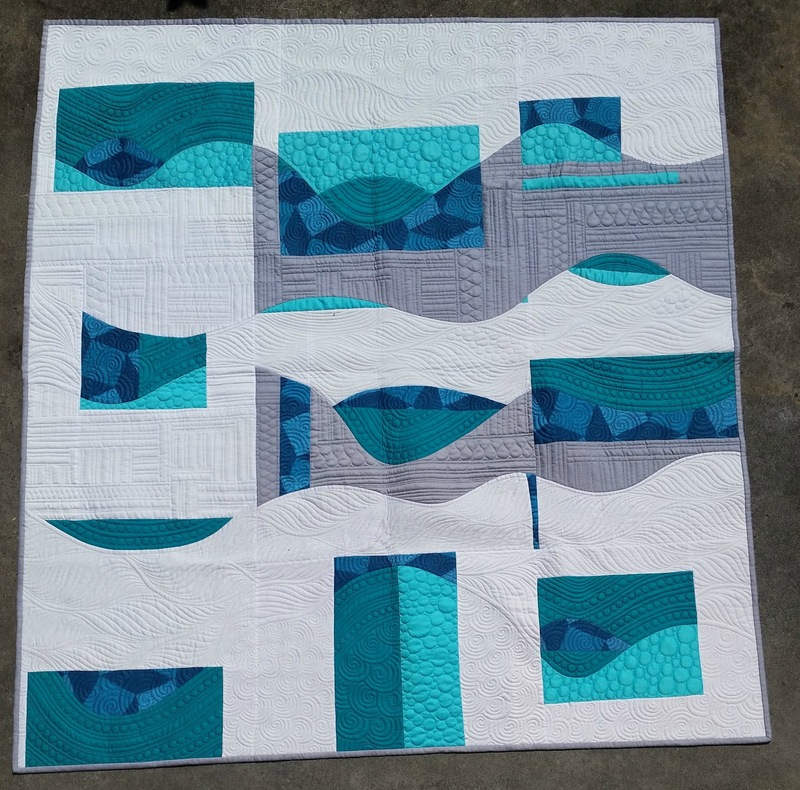 Mainly because I didn't actually know anyone who quilted and I didn't want to bore my family and friends to tears constantly talking about my quilts, and blogging was the perfect way to share what I was making. But it quickly became a way to connect with people all over the world who shared my passion. I'm ever in awe of how supportive and wonderful the online quilting community is, and my life would be very different if I hadn't started blogging. I am a self-taught quilter, thanks to the enormous generosity of so many people in sharing tutorials and ideas, and a love of trying to figure out how to make things work! I loosely call myself a modern quilter - although I've made plenty of quilts that are far more traditional than modern! I think I'm probably best known for my love of free motion quilting - everything I piece is quilted to death on my domestic Bernina. About three years ago, I was actually invited to become a Bernina Ambassador here in Australia, which is an incredible honour :o). I have several free motion quilting tutorials available on my YouTube channel - and I plan on doing a lot more of these this year! I've been teaching patchwork and quilting classes on a weekly basis for the last three years (although I'm currently having a break, after burning out from a pretty hefty teaching load last year), which is something I absolutely love. Last year was a big year for me as a quilter, both on a professional and personal level. 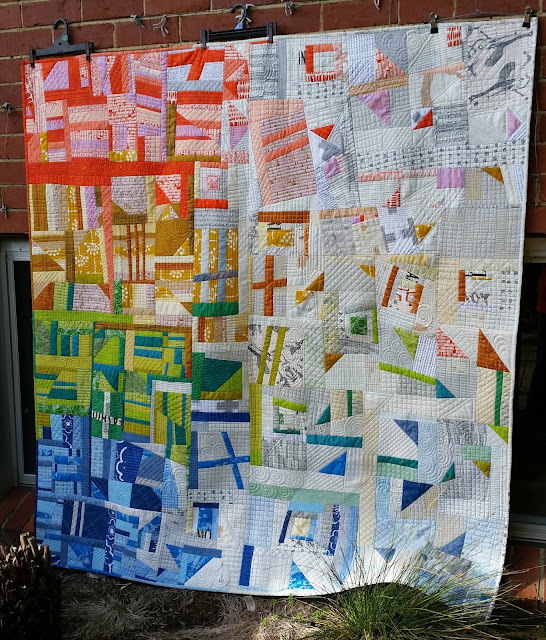 I won several awards for my quilts at some of our national quilt shows (the Australian Modern Quilt Show and the Australian Machine Quilting Festival), and I taught a lot of classes - both patchwork and free motion quilting. On the personal side of things, I feel like I really grew as a quilter. Although I've always loved making quilts and been happy with the finished product, I've struggled to find my style. But in the last half of last year I feel like I started to find my voice, and started making quilts that are more 'me' than ever before. 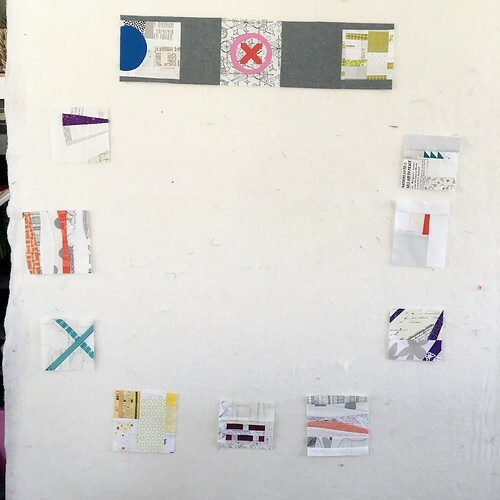 Although I've always used and loved my design wall, I now rely on it constantly as a tool to design my quilts. Aviatrix is one of the last quilts I made using someone else's pattern - and I think it will be the last for a fairly long time. I'm enjoying doing my own thing so much right now! 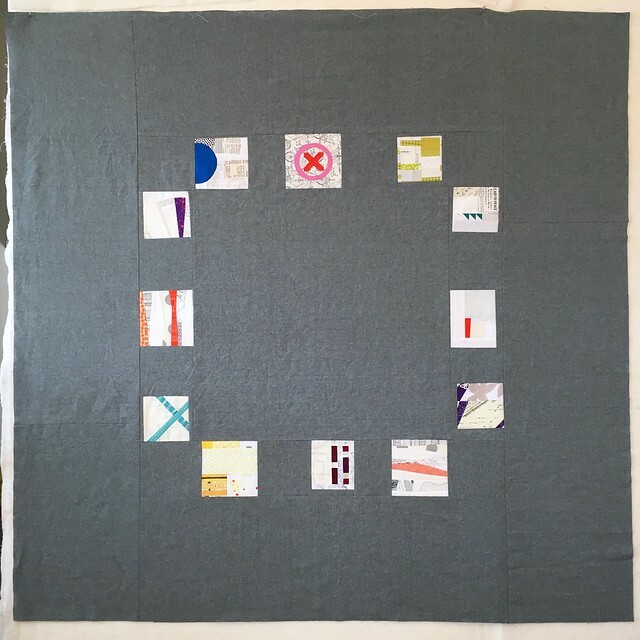 The last few quilts I've made (and my current work in progress) all started as a vague idea and a giant pile of fabric, and relied on my design wall to figure out what they would become. You can read all about the process I went through when making Scattered (shown below) here, here, here and here. 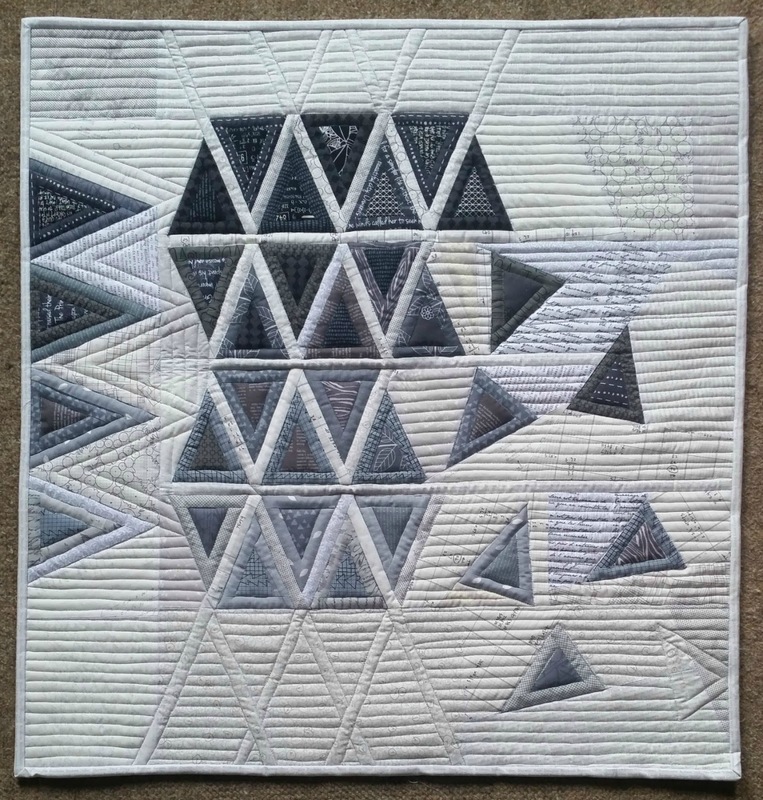 And if you're attending QuiltCon this year, please go say hi to her - she was juried into the show which is enormously exciting! I recently wrote about the process of making one of my recent finishes, Flow. Again this quilt started as a pile of fabric and a very vague idea (as in, I knew I wanted to use improv curves), but the design came together through trial and error. Although I'm much better at starting and finishing projects than I used to be (which isn't to say I don't have any WIPs - there are lots of those! ), I work best when don't feel like I *have* to work on a particular project. Which is probably why I make FAL lists and then largely ignore them... Having said that, I have several projects that have been ignored for far too long that I do want to finish this year, so next quarter you can expect me to fully participate and knock over some very long term WIPs! Thanks for letting me introduce myself (and my quilts! ), and I look forward to cheering you all on this year as you work through your FAL lists! 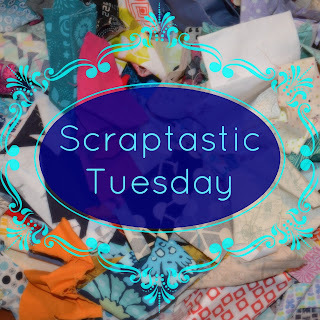 February Scraptastic Tuesday Link is Open! It's the second Tuesday of February and that means that the Scraptastic Tuesday link is open. Happy Valentines Day! Please share your scrappy projects, in progress or completed or your tips for using or organizing your scraps. Well, you have probably noticed my less than resounding start to blogging this year. I am working to change that. I had a real failure of creativity at the start of this year, 2017 has been a bit of a hard landing so to speak. I think that has changed finally and I have been able to do some sewing again. I am not making any promises but I do have some things to share so I will work on catching up here. For today I will share the progress of the project I shared last month for Scraptastic Tuesday. After debating for about a full month, I decided to go with the minimalist layout for my Bee Sewcial Swap Blocks. These blocks are 4.5" to 6" square. Also I had recently received some Essex Yarn Dyed Linen (a 55/45% cotton/linen blend) in Shale. I decided to use that as my background instead of the scrappy background and instead of the blue linen I had tried - the blue washed out that block with the half circle and the shale will look great with my light grey sofa. This layout was easy to piece together. First I pieced each of the sides of the medallion block lay out into strips. 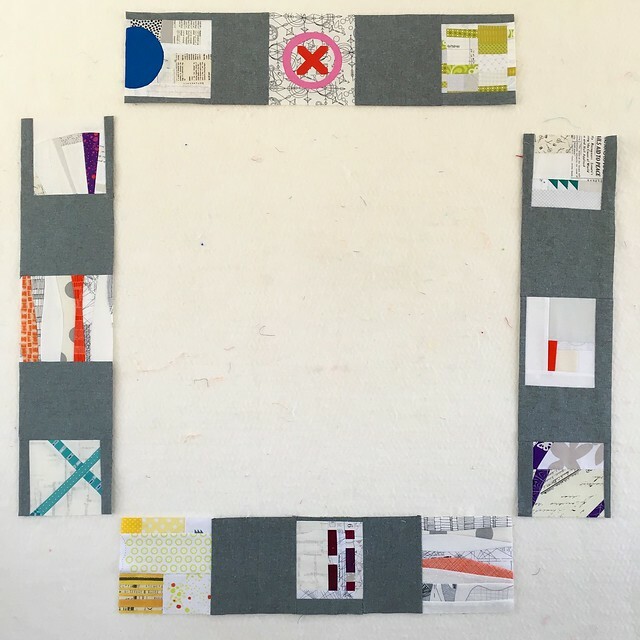 You will see that I did not line the blocks up exactly - I wanted to have a bit of an improv look within the geometric layout, but I did made strips that were 6.5" wide to accommodate the largest block. Then I added the background. I wanted to have a quilt that was a good lying on the sofa, watching TV or movies, size and ended up with about 60" square. I have a dense quilting idea in mind and I also pieced the back this weekend so hopefully I can start quilting it soon. I'm looking forward to seeing what you have to share with us this month. 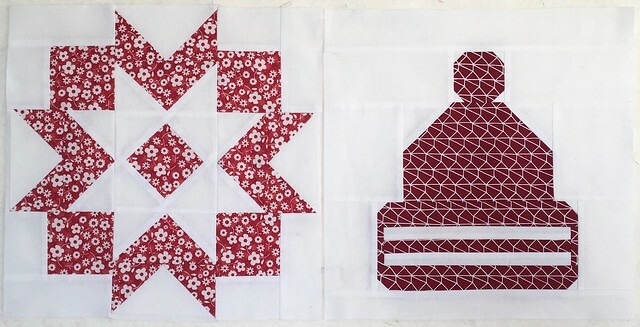 One of the things I wanted to do this year was to find a quilt pattern with a set of traditional sort of blocks with a modern slant to the overall quilt. 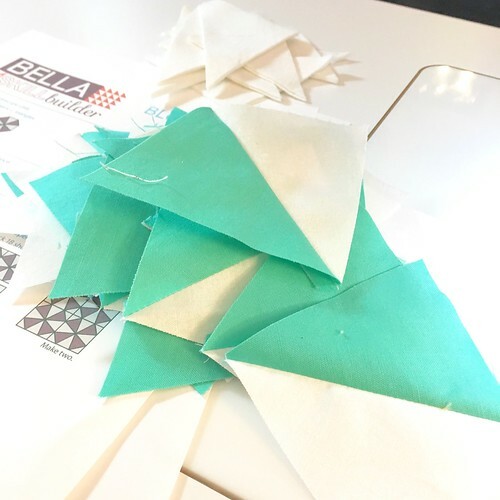 Then, in my inbox popped an invitation from the Fat Quarter Shop to sew along with the Bella Skill Builder and I was in. I mean, look at that quilt. A beautiful, modern geometric set of blocks, and a skill builder as well. I love to work improvisationally, but I also love to maintain excellent sewing skills. This 10 month free quilt along met all my criteria. Maybe you will want to join in too - go here for all the details from the Fat Quarter Shop. 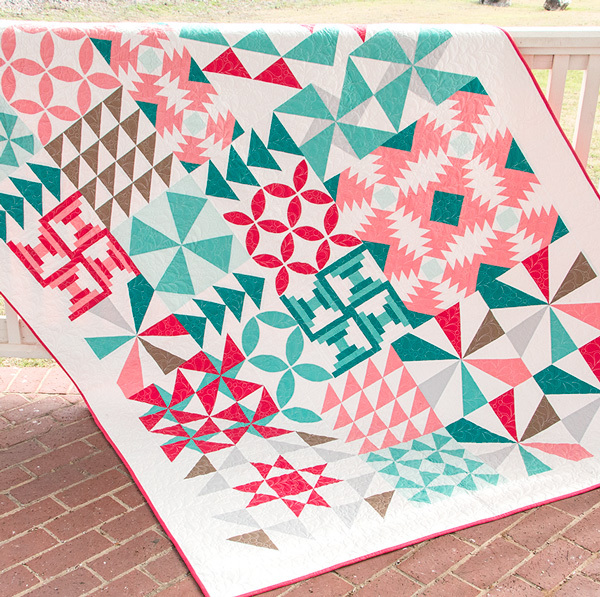 February is the start of the quilt along and it starts with Kaleidoscope blocks in two sizes. I am going to order more Bella Solids and I might change the colour scheme a bit, so I started with just one block for now. I have the whole month of February to do the other two. This free pattern uses a clever approach to kaleidoscope blocks that is fast and stress free. I chain pieced the units. I did stop to press the units at each addition. Given that these are triangle pieces and thus have bias cuts, I was careful to press, not iron, so as to avoid stretching them. The units come together quickly! This is my first block, it will finish at 12" square. I am debating my decision to deviate from the pattern's suggestion of a dark and light fabric of the same colour for this block. I think I might make the other 2 blocks with the coloured background, but we shall see. 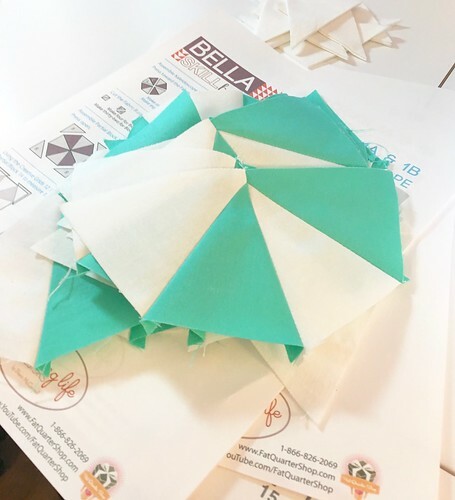 You can read all about the Bella Skill Builder and visit the other bloggers sewing along by going here to the Fat Quarter Shop's Jolly Jabber Blog. Maybe you will decide to sew along too, I share my progress on the other two blocks later this month and will be back at the beginning of March with next month's block too.